Rob Baxter has promised that come Monday his side’s latest loss to Saracens will be “put to bed” and the focus will quickly switch to Exeter’s next away-day at Sale Sharks on Good Friday. The Chiefs head coach could only watch on as his team slipped to their heaviest home defeat of the season as Saracens triumphed 33-12 in a powerful display at Sandy Park. Tries from Chris Wyles, Rhys Gill and Noah Cato, together with points from Alex Goode (15) and Owen Farrell (3), paved the way for the visitors to avenge their own home loss by Baxter’s boy at Vicarage Road back in October. Although the Chiefs countered with tries from centres Jason Shoemark and Sireli Naqelevuki, the latter of which was converted by Ignacio Mieres, the Devonians were undone by a powerful Saracens outfit who are beginning to hit form at just the right time. “To be fair, you just have to take it on the chin,” said Baxter at the final whistle. “Today I think we’ve had to learn some lessons off a very good Saracens team who are cranking it up at this stage of the season. “As I just said to the guys, this is a tough league and when you come up against a good side who are cranking up to win big things at the end of a season, you have to meet that threat head on. At times we did that today, there were periods in the first half and then a good period at the start of the second half where we did well, but ultimately we can’t say we played well enough to get anything out of that game. 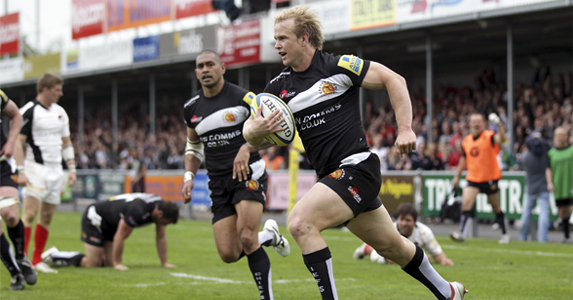 The loss, Exeter’s fourth on the trot, means the Chiefs will now head to Sale this Friday looking to get their season back on track in what will be the club’s penultimate fixture of the season. Before then, however, the club will first have to appear before a RFU disciplinary hearing after they fielded three overseas players – rather than the permitted two – in the recent Premiership games against London Irish and Leeds Carnegie. Baxter, who is confident his team will show improvement at Edgeley Park, added: “I’m not massively disappointed, but I have just to the guys if we promise we are going to enjoy this season and thrive on tough times, then we have to do that. There is no way any of them enjoyed that game out there today, so we have to make sure we improve. “The good thing, I suppose, is that we have a quick turnaround and we can put this game to bed on Monday. Once that is done that will be the end of it and we can enjoy a relatively short training week and then get on the bus to Sale and spend some time together, We’ll just lo0ok to crank up where we are going and look to perform better against Sale. “Today was not the best day at the office for us. I’m disappointed, of course I am, because that was the first time this season we have not got something from a home game. That said, Saracens are not top of the league for no reason. Sometimes when things go well for a team they get away from you and that is what happened today.